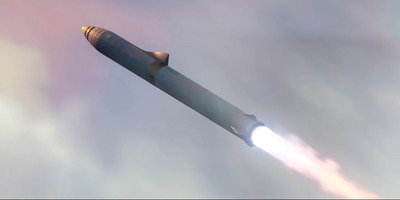 SpaceX/YouTubeAn illustration of SpaceX’s Big Falcon Rocket. Elon Musk is working on something out-of-this-world in Los Angeles. The founder of SpaceX has spoken for years about building the Big Falcon Rocket: a giant reusable launch system designed to get people to and from Mars (and perhaps around Earth). Most recently, Musk said SpaceX hopes to begin short up-and-down launches of the BFR system’s 157-foot-tall spaceship in early 2019. 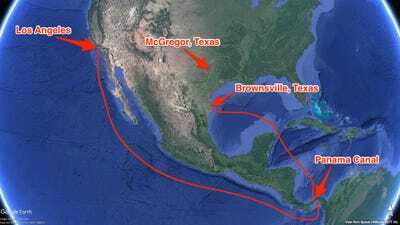 The testing will occur on the company’s McGregor, Texas, campus. Until now, however, SpaceX has been mum about where, exactly, it plans to build such enormous rockets. On Monday, a member of the r/SpaceX community on Reddit noticed a curious move by the Board of Harbour Commissioners in Los Angeles. 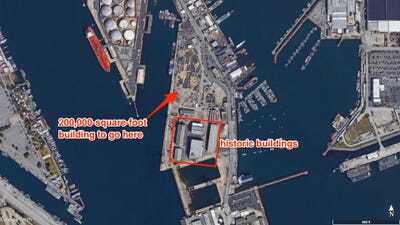 The organisation recently and quietly approved a 788-page plan by SpaceX to lease an 18-acre site in the Port of Los Angeles, including a 200,000-square-foot facility to “to manufacture large commercial transportation vessels”. 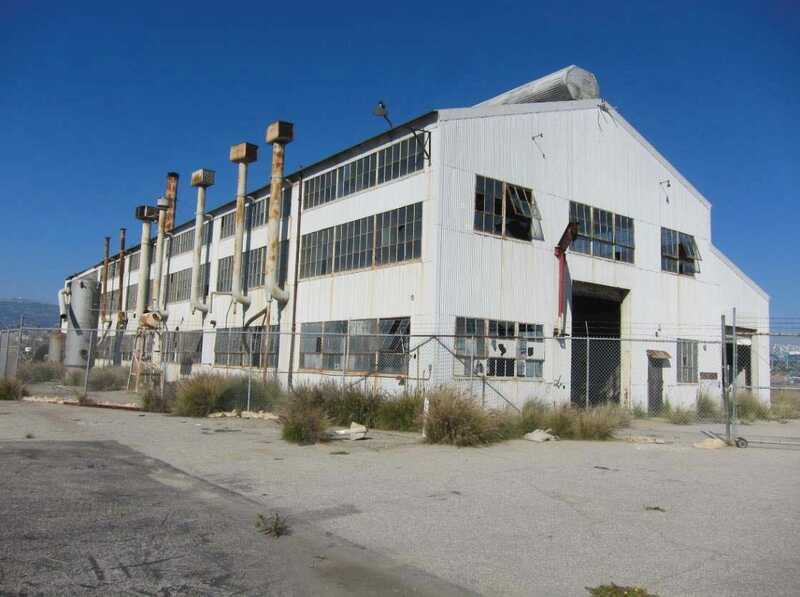 A source close to the matter told Business Insider that SpaceX is likely just weeks away from being officially offered a lease to the site. 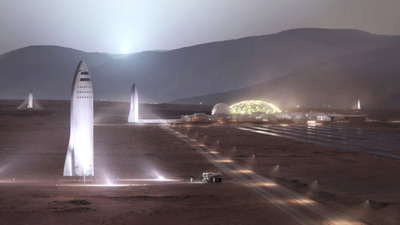 Here’s what we know about the proposed plan, and what SpaceX’s “state-of-the-art” Mars rocket factory may look like when finished. 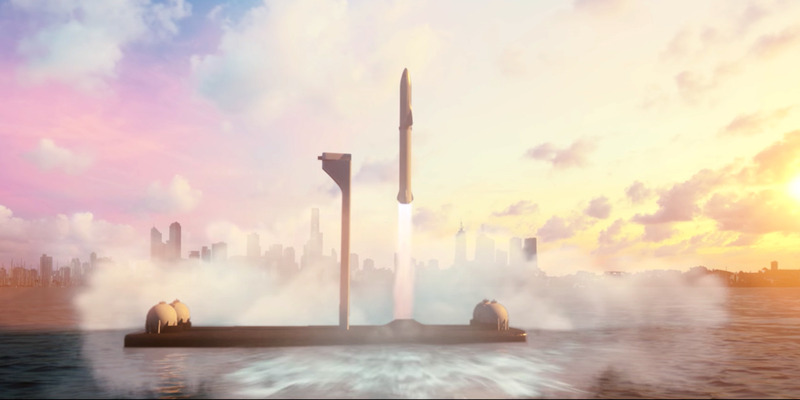 Musk has dreams of colonizing Mars with reusable BFR spaceships that can carry up to 100 people or 140,000 lbs into space. Eventually, he’d like 1 million people to colonize the red planet over decades, as a backup plan for Earth. 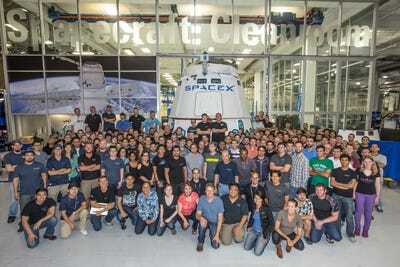 SpaceX/YouTubeReusable spaceships might enable SpaceX to colonize Mars. 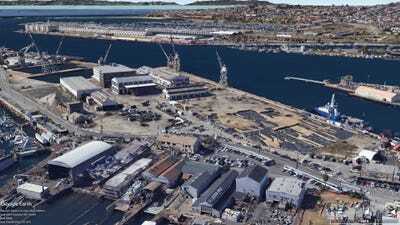 Fully assembled, the BFR will be about 348 feet tall — some 40 feet bigger than the Statue of Liberty. SpaceX/YouTubeAn illustration of SpaceX’s and Elon Musk’s ‘Big F—ing Rocket’ system launching toward space. To transport the rocket’s enormous spaceship and booster to a launch site, the company will need to use a boat. 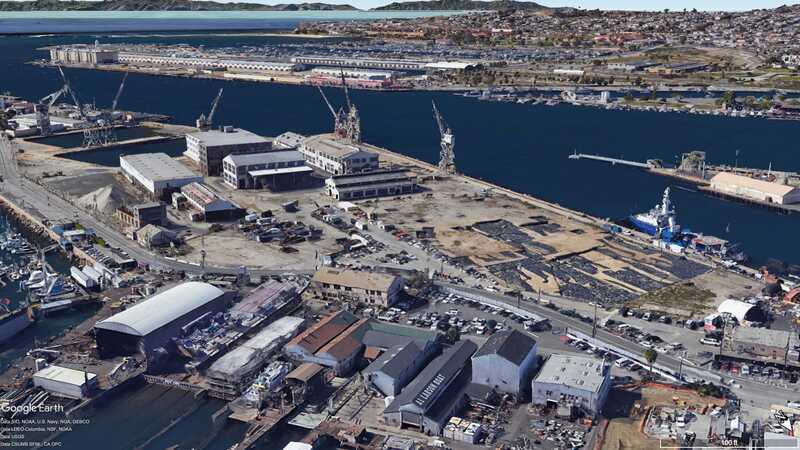 Because of that, SpaceX’s campus in Hawthorne isn’t a practical location to build and assemble the BFR since it’s not on the water. 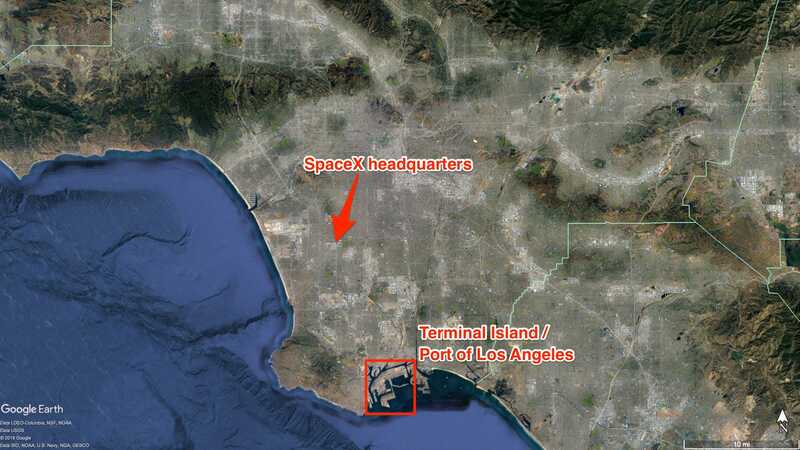 That’s why SpaceX hopes to get a 10-year lease on Terminal Island, which is about 14 miles southeast of its headquarters. 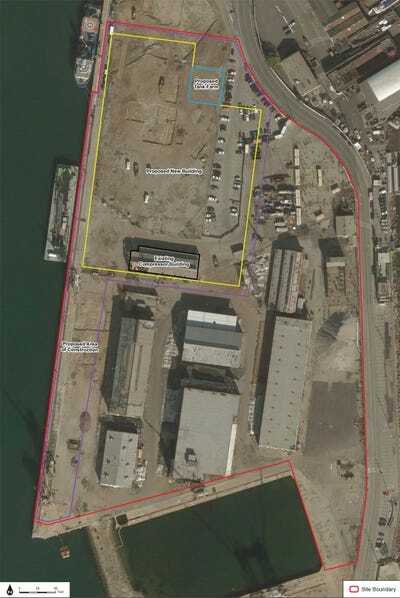 The company has drawn up plans to fix up and develop Berth 240: an 18-acre site. 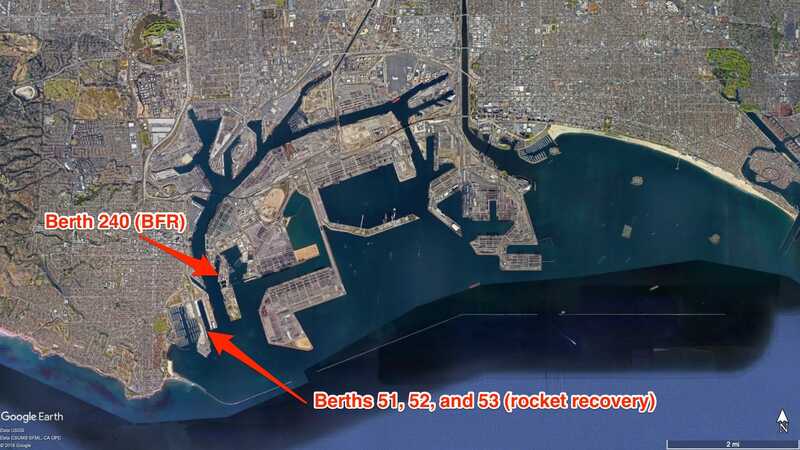 SpaceX already has access to three LA berths for ongoing rocket recovery operations. SpaceX currently leases Berths 51-53 for about $US3,500 per acre per month. The company uses them to recover any Falcon 9 rocket boosters it launches from Vandenberg Air Force Base. The boosters tower about 15 stories high, land on a robotic ocean barge, and return to land by boat. This saves millions of dollars per launch. 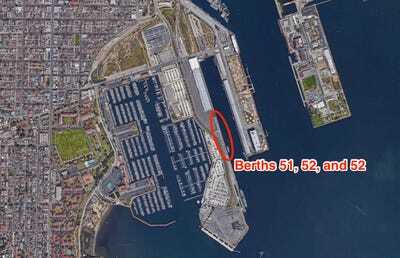 The berths SpaceX currently uses are on the Port of Los Angeles’ East Channel. 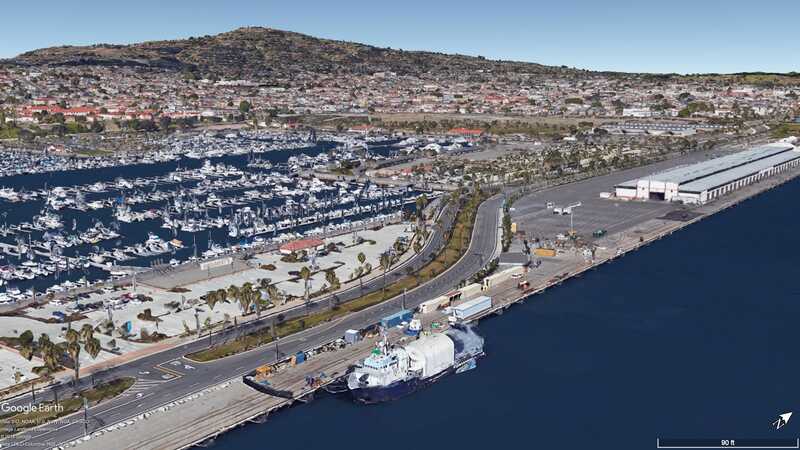 “They have already got about eight acres — 8.1 to be specific,” Phillip Sanfield, director of media relations for the Port of Los Angeles, told Business Insider. The new site SpaceX hopes to lease — Berth 240 — is less than a mile away from the other berths, and 222% larger. It’s also home to some historic buildings. 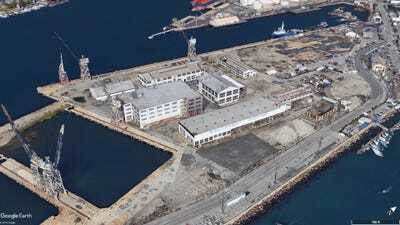 Berth 240 has been dormant since 2006, aside from a few TV and movie shoots. During World War II, it was used to crank out Victory ships to help transport US soldiers home en masse. Google EarthA satellite view of Berth 240 in August 2003. 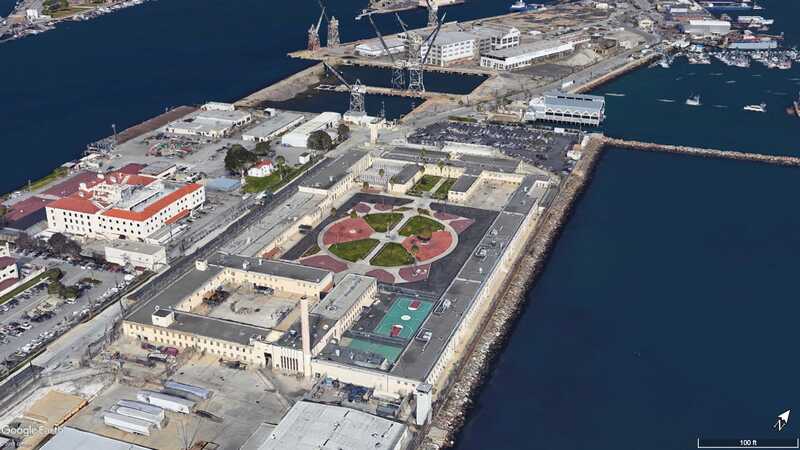 The plot is close to a low-security federal prison (shown at center) and a commercial fishing dock, which should help keep the rent cheap. 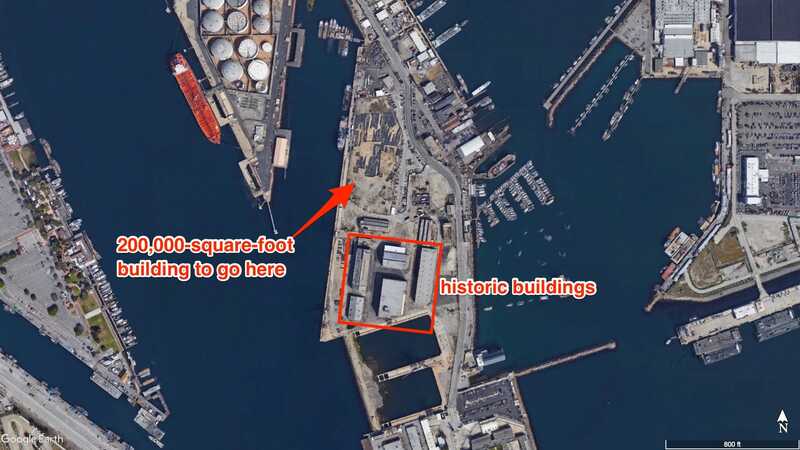 SpaceX plans to work around the historic buildings and build a 200,000-square-foot spacecraft factory, dubbed “Building A,” according to its proposal. 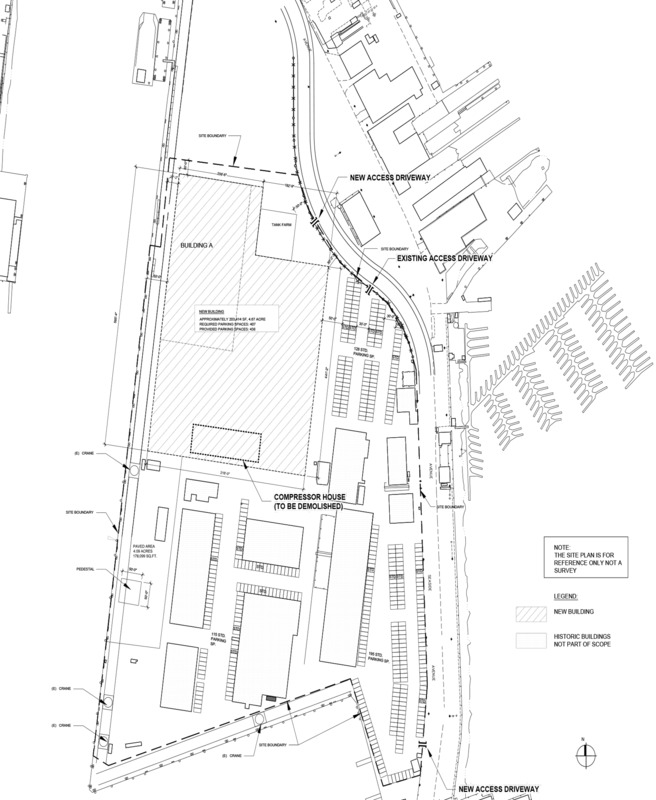 There will be enough parking for 438 cars, which will allow plenty of SpaceX engineers and technicians to come work on getting to Mars. SpaceX’s report contains low-resolution 3D renderings that show what Building A might look like. 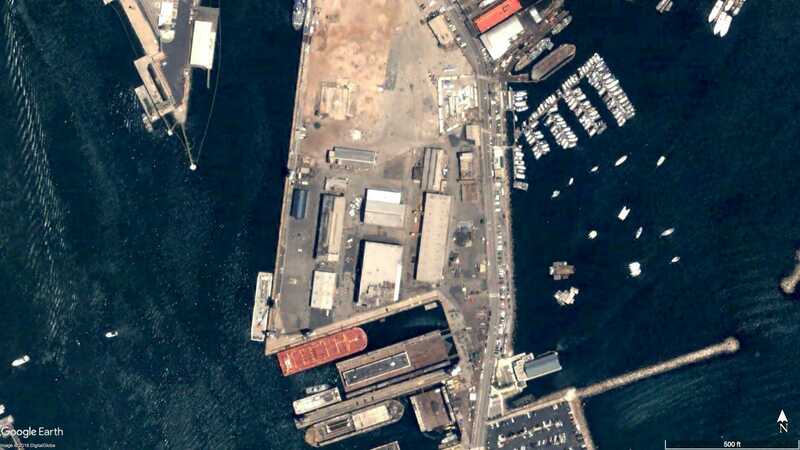 Another view more clearly shows a Falcon 9 rocket booster on the site. The plans call for building a pedestal for the rocket, so it will probably serve as a monument to celebrate reusable rocketry. Right now, the site is a bunch of dirt, gravel, and broken asphalt. 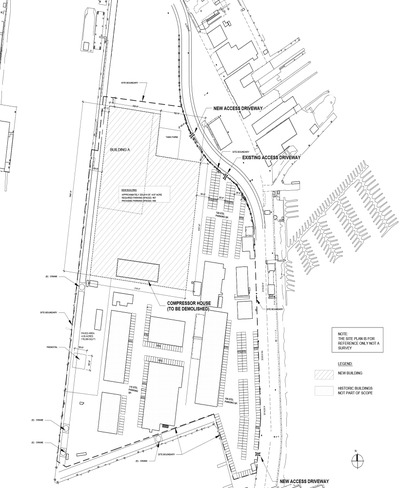 Some of the land is contaminated with chemicals and has to be dug up and buried somewhere else. 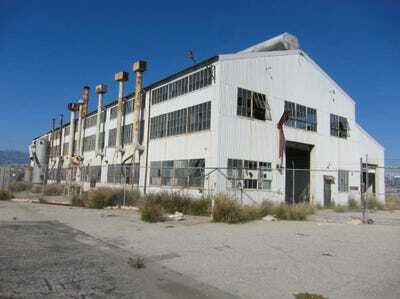 SpaceX will also have to knock down this decrepit pumping station to make room for the facility. Once complete, the BFR components will travel by ship. To where, you ask?